Members of the Fort GreeneVille Daughters of the American Revolution are pictured with Clay Johnson. 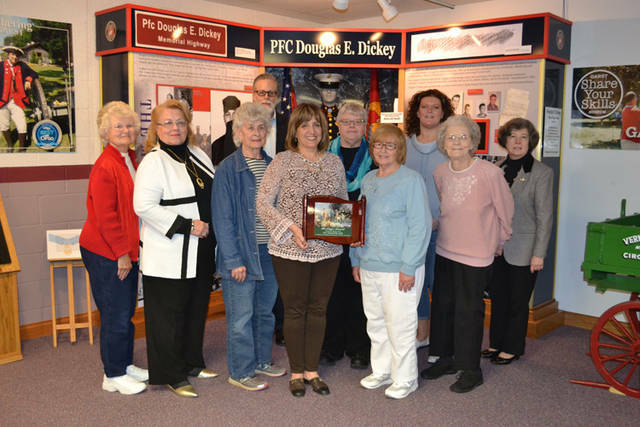 DARKE COUNTY – The Darke County Historical Society’s Heritage Award was created in 2004 to recognize distinguished citizens or organizations for their outstanding contributions or actions of unusual excellence that help connect people to Darke County’s past. The DCHS operates the Garst Museum according to its mission to collect, preserve, exhibit, study and interpret materials relating to the history and culture of Darke County. This year’s Heritage Award goes to the Fort GreeneVille Chapter of Daughters of the American Revolution. The Fort GreeneVille DAR chapter was organized in January 1922. Over the years, the chapter has flourished and received high honors for its work in various areas that the DAR stands for. Honoring patriots of the Revolutionary War, the women’s service organization promotes historic preservation, education and patriotism. Today, the chapter has 61 dedicated members that own the Studebaker Schoolhouse, the first brick school house erected in 1840 in Darke County. The school house was gifted to the DAR in 1934, and the chapter has maintained the grounds and school as an entrance to Greenville on State Route 49. The DAR is active in the county searching for the gravesites of Revolutionary War veterans. More than 20 Revolutionary War patriot graves in Darke County have been identified with grave markers or rededicated since 2016 with more to come. The members donate their time and money to preserve veterans’ uniforms and memorabilia in the Veterans’ Building at the Darke County Fairgrounds. They have encased 31 uniforms over the past two years. They help organize and participate in Veterans Day parades and activities. This past December, they participated in Wreaths Across America at the Greenville-Union Cemetery and placed approximately 300 wreaths on veterans’ graves. The chapter has donated numerous genealogical and historical books to local libraries and presents historical programs at local schools. Sustaining its legacy, the organization continues to accomplish its mission with such high integrity. It is with great appreciation that Garst Museum recognized the members of the Fort GreeneVille Daughters of the American Revolution and honored its members with the 2019 Heritage Award for their dedication in preserving history, promoting education and honoring patriots. The Garst Museum is located at 205 N. Broadway, Greenville. For more information, visit www.garstmuseum.org, call 937-548-5250 or email information@garstmuseum.org.